View Snowflake Album of what kids have made. "Don't forget to add a note (who made them, age, from where)"
Visit: http://www.ctpta.org/SANDY-HOOK-FUND.html for more information. 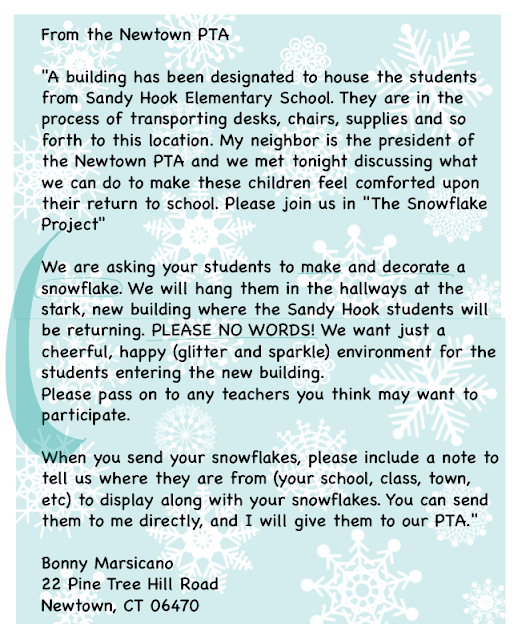 You can also "send a picture of your snowflakes to crafts4newtown@gmail.com to get them included in an album, our gift for Newtown- check www.facebook.com/SandyChildrenHelp for more info."